WHEN something tragic happens in our lives—the death of a loved one, an incurable illness, a sudden loss of income, a marriage breakup, etc.—we often question why it has happened. We get depressed, sometimes going into a downward spiral that more often than not, throws us into a deeper crisis. We rail at God, or family and friends, or we blame ourselves for not having done enough to prevent the tragedy. Some of us eventually snap out of it, get better, and move on in our lives. Unfortunately, others don’t. 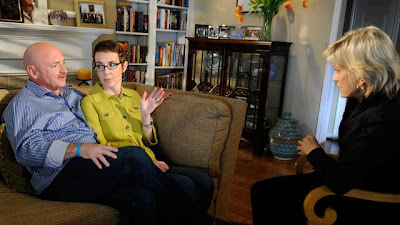 The story of Rep. Gabrielle Giffords shows us that recovery is possible. No matter how high the odds against us, we will be able to overcome them—if we want to. It takes courage, hope, and a lot of love...as her husband, former astronaut Mark Kelly, has shown. As I write this, I’d just watched the ABC 20/20’s feature on Giffords and Kelly, a very touching profile piece by award-winning journalist Diane Sawyer. It was a very moving and heartwarming interview. It’s just the kind of story that makes us want to keep praying and cheering on those who are in similar situations like Giffords—whether the handicap is physical, emotional or spiritual. For those who don’t know her, Giffords was the US congresswoman from Arizona who was shot in the head by a mad man on January 8 at a meet-and-greet in a supermarket in Tucson. Six people died, including a child, and 13 others were injured. Kelly, meanwhile, was an astronaut; he was the one who piloted the final journey of the US Space Shuttle. According to Giffords’s doctors—I had been monitoring the news updates on her condition over these last 10 months—there were so many ways that bullet could’ve changed the congresswoman’s condition. If it had hit a certain part of her brain, she would’ve been instantly killed. If it had hit another area, she would have lost her ability to speak. Another area controls movement, and if that had been grazed even just so slightly, she would not have been able to walk again. They showed her walking as well—every morning Kelly helps her walk to the mailbox to get their mail and back to their house. It’s clear that despite her injury, her comprehension has not been affected. She understood the questions Sawyer asked her, and answered them pointedly. But she struggles. Giffords cannot yet string sentences together. The profile piece also showed video clips from footage shot by Kelly detailing his wife’s progress. Apparently, he started filming his wife the day right after she was shot, documenting the challenges she faced and the progress she made in her recovery over these last 10 months. They have also co-written a book, Gabby: A Story of Courage and Hope, which tackles the incredible journey of the congresswoman from a bedridden patient, to someone who talks, thinks and walks. Of course, all that wouldn’t have been possible were it not also for the therapists hired to help her regain her speech and movement. There she was, still stitched up badly in her hospital bed, but conscious, saying one of her first words—“you”—as a speech therapist asked Giffords to fill in the blank in a song she had just been taught (“I love you, you love me...”). The footage also shows Giffords breaking down in her speech therapist’s arms, unable to say the many things she wanted to say. She felt “trapped,” as she told her husband one day, as her mouth seemingly refused to form the words that were floating in her mind. In a brain injury such as that suffered by Giffords, therapists often have to help their patients “rewire” how their brain thinks. Apparently, music played a very large part in helping the congresswoman re-learn words. According to Giffords’s music therapist, songs help the brain access the lyrics/words through another part of the brain. While doctors didn’t say so on tape, they have told Sawyer that they couldn’t deny that there were indeed some miracles involved in Giffords’s recovery. A brain trauma specialist interviewed by Sawyer didn’t set limits on how far Giffords would be able to go in her recovery. The specialist added that if Giffords sets her mind to even going back to Congress, she wouldn’t be surprised if the latter does just that. When Sawyer asks if she still wants to run for Congress next year, Giffords stops a few times, sits up straight as she tries to gain the momentum to try force the words out her mouth, while her left hand makes a forward motion. Kelly ends up saying it for her: “She wants to get better.” And she repeats it, “better, better,” while nodding her head vigorously. It’s also evident that Giffords’s husband has helped immensely in pushing her recovery. He tells Sawyer how he would compose himself before he would enter Giffords’s hospital room every morning. He always encouraged her, and was extremely optimistic of her recovery. Whether he really believed it, or it was just bravado on his part, Kelly was unwavering. He even put up a sign outside Giffords’s room warning her visitors not to cry. Knowing how his wife is very goal-oriented, Kelly set goals for her. He put her sneakers and socks in a nearby chair, so she could work toward putting these on and walking again. Any lesser man would’ve probably given up on a bedridden wife. It was a testament to his love and dedication to his wife. Amid all the problems facing us and our country, it helps to watch positive pieces like this story of Giffords and Kelly. It puts our own issues in perspective, and encourages us to not lose hope. Yes, it will be “difficult”, but persistence is the key. All things are possible once you set your mind to it. * To watch Sawyer’s interview of Giffords and Kelly, go to abcnews.go.com.